The weather is too cold here and I went into a kind of hibernation in the blogging front. Not much posts or blog hops. So to get inspirations for the next post, I asked for suggestions in my FB page, ideas started pouring in. Since two of our friends suggested paneer dish, I decided to prepare paneer dish. 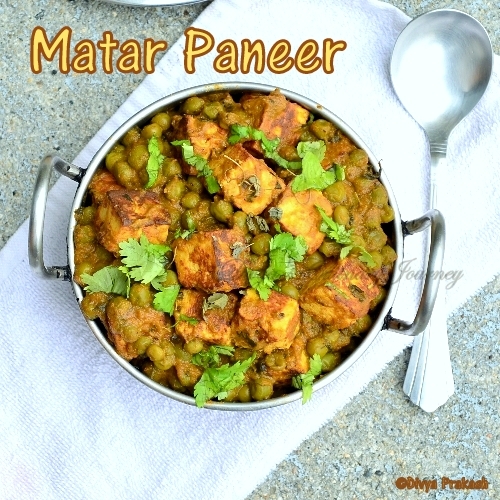 I have already posted Palak paneer, so today am posting Matar Panner. It is a rich gravy made with green peas(matar) and Cottage cheese (Paneer). I make this often at home and everyone love it. There are different versions of this gravy in the net. This is my version of matar paneer without cream or cashews. Cut the paneer into cubes and shallow fry them till they are slightly browned. Drain them in paper towel and keep them aside. In a pan, heat oil, add fennel seeds, cloves, cinnamon stick, cardamom and fry for a minute or two. Then add onions and green chillies and saute till onions are translucent. Then add the ginger garlic paste and all the powders (turmeric, coriander, chilli and cumin powders) and mix well. Finally add the tomatoes and cook till the tomatoes are cooked and turn mushy. Let it cool and puree them in a blender into a smooth paste. Then return the puree into the pan and dilute it with water as per the required consistency and let it simmer. Now add green peas and required salt and cook for 3-4 minutes and when the peas are cooked, add paneer and cook for another 2-3 minutes and then add kasoori methi and milk, mix well and cook for another 2-3 minutes. Add chopped cilantro and turn off the heat. Serve with roti or rice of your choice. It serves 3- 4 persons. The gravy thickens with time. So adjust the consistency before serving. This is my kids most fav curry, delicious preparation...inviting pictures dear...love it ! Delicious, loved your version too..
Looks so tempting.....very delicious dish. 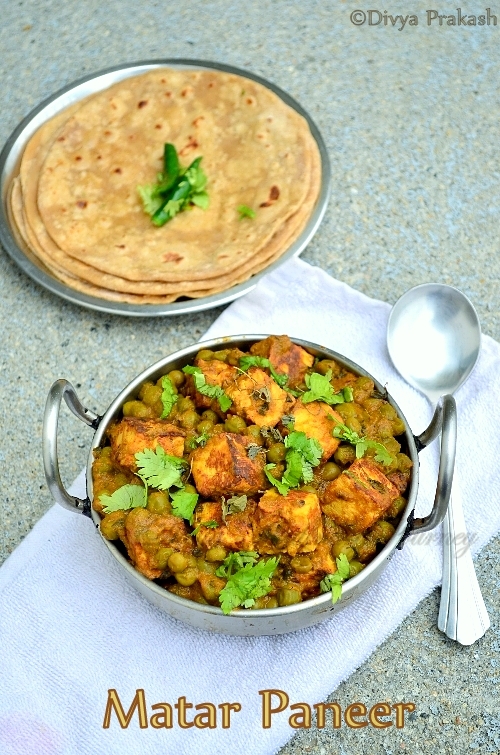 clean and clear click :) love it anytime..
Cant ask more, wat a delightful and droolworthy mattar paneer. loved the dry version,looks perfect!! Lovely clicks Divya :) And matar paneer without cream or cashews sounds really interesting :) Good one!! 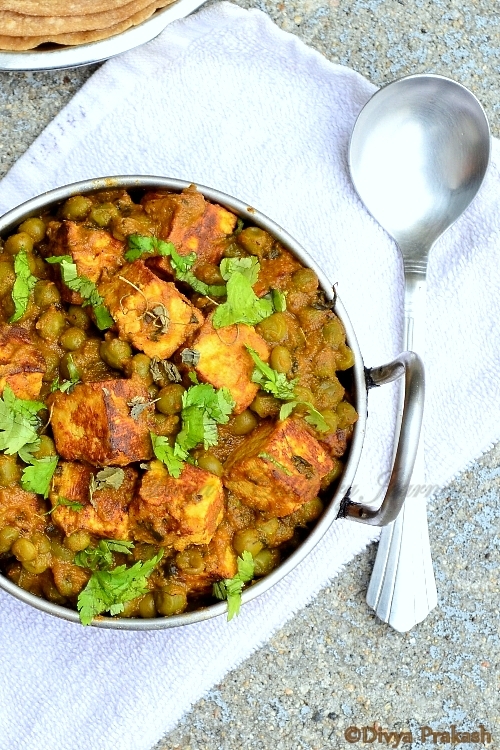 Delicious matar paneer love you made without cashews. great. Hi Cynduja.. Please refer step number 5. I have used milk there..